In January 2014, a Snowy Owl got stuck in an abandoned building in downtown Portland, and Maine Audubon staff were called on to assist. Both on scene that day and in the days following, we saw a fantastic opportunity in this front page story to explain basic wildlife ecology, why animals venture far from home, and what positive human intervention looks like. Our friends at Islandport Press agreed, and together we set to work developing a series of books that would help introduce and expand upon these important themes for families and classrooms in Maine and beyond. 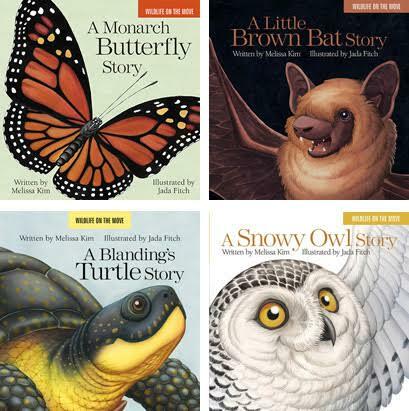 These became A Snowy Owl Story, A Blanding’s Turtle Story, A Little Brown Bat Story, and A Monarch Butterfly Story. The goal of the Wildlife on the Move series is to bring well-written, engaging stories about wildlife migration, conservation, and respectful human interaction with nature to a Pre-K through second-grade audience. Islandport writers, editors, and designers worked with naturalists at Maine Audubon to produce a scientifically accurate, narrative nonfiction story that is designed to appeal to a young audience. All four books are written by Melissa Kim and illustrated by Jada Fitch. Each 7” x 7” board book has 12 boards/24 pages and costs $10.95. Ten percent of the proceeds from the sale of the Wildlife on the Move books help to fund Maine Audubon’s outreach programs for underserved preschools. Each book has a companion Teaching Guide written by Maine Audubon Early Childhood Education Program Manager Molly Woodring, complete with discussion questions, three units of lessons and activities, suggestions on how to take action and how to take learning outside, connections to learning standards, book lists, songs and finger play, and reproducibles. Perfect for story times and read-alouds, all the Wildlife on the Move board books are also available in large-format sizes. Each book is available as a beautiful, sturdy, and practical 13” x 13” coil-bound book. To order, email info@islandportpress.com or visit islandportpress.com/wildlifeonthemove. All four Wildlife on the Move books are available as corrugated story walks for educators to borrow. The story walks are also installed seasonally at Maine Audubon’s Gilsland Farm location. Visit the Educator Resource Center for more information. The species chosen for the Wildlife on the Move project are iconic, charismatic, and most importantly representative of the challenges facing Maine’s wildlife. Even students who have never seen a Snowy Owl, for example, are able to relate to the experience of living in Maine. Though the story of each species is unique, they explore similar themes of animal movement, human interactions with wildlife, animal adaptations, seasonal changes, and habitat requirements. The Wildlife on the Move books are written for preschool-aged children through second graders, with simple prose supported by a strong foundation of scientifically accurate content and illustrations. This allows educators — aided by the curriculum guides, to dig deeper into the underlying scientific concepts and to challenge older students to take on a greater load of the cognitive work. The smaller board books allow students of all ages to explore the books at their own pace and practice reading skills, while the large teacher editions allow for large group reading and discussion while inviting further interaction with the detailed illustrations. Maine Audubon provides a variety of services that can enrich and support your use of the Wildlife on the Move books and teaching guides, including classroom visits, field trips, and curricular coaching for early childhood and grades K-5; educator workshops; and rentable materials through our Educator Resource Center (PDF).